“Then don’t do that,” the doctor tells him. It’s good advice, and we ought to be taking it as a society. 80 billion plastic water bottles are produced each year from scarce petroleum, and 80% of them will wind up in an ocean or a landfill. There they will take 800 years to break down. It hurts when we do that, everyone agrees. But we seem determined to keep doing it. That isn’t to say there are no other treatments; recycling is important, of course. But until we stop producing so many plastic bottles, our landfills are going to continuing filling, and our oceans will be awash with debris. Paper Water Bottle has just launched its first Kickstarter campaign. It’s an innovation built on that admittedly obvious insight: if you want fewer plastic bottles thrown away, you have to produce fewer plastic bottles. You have to replace them with something better. The Paper Water Bottle will be a Refreshing Alternative. 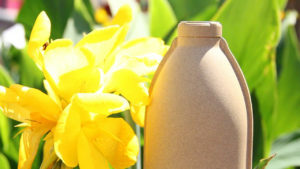 Made from renewable pulp fiber, its aim is to be Backyard Compostable, returning to the earth simply and easily. It’s a product consumers can use without sacrificing the convenience they’ve come to expect. It’s portable, attractive, and sustainable. It’s designed to last long enough to serve your purpose—and then to return to its component parts. When was the last time you held on to a plastic bottle for 800 years? As Paper Water Bottle nears its first production run, it’s clear that water is just a start. Thousands of products are waiting to be improved by packaging that helps rather than harms the environment, that contributes to the strengthening of ecosystems even as it strengthens brands. Surely we can all agree, oceans ought to be clean, and landfills ought to be tiny. Now we have the tools needed to make it happen. And it can happen much sooner than you think.